Sony's readers: (L-R) The Pocket Edition ($199), e-Reader ($299) and the newly announced Daily Edition ($399) with 7" touch screen. They say “those who do not study history are bound to repeat the same mistakes…” Well someone at Sony Electronics must be paying attention. Especially regarding how Apple came in and pushed Sony’s Walkman music players to the curb. Now Sony is trying to do the same thing to Amazon’s Kindle book reader. Sony has just announced its Daily Edition electronic reading device. Readers can use the unit’s touch screen to swipe (turn) a page plus view pages both vertically and/or horizontal (2 at a time). Also significant is that, unlike the Kindle, this unit can download books from a variety of sources including free books from your local library, if you have a library card. Kindle users are only able to download books from Amazon. iTunes at first used the digital rights management approach to keep iPods tied to its store, but later decided to eliminate the DRM restrictions, as did many other sites. The net result of no DRM was that the music and players became more platform independent, something which Amazon may now reconsider in response to Sony’s new offering. 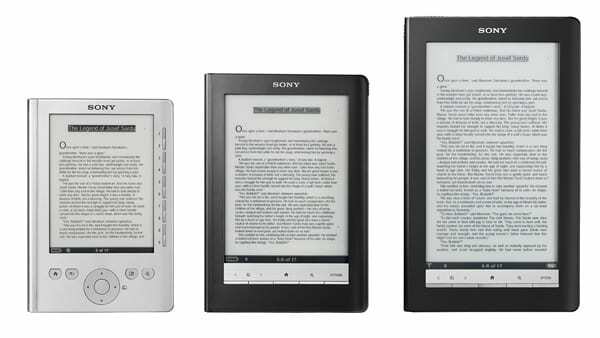 Sony is using the EPUB format which can be read by a variety of different readers, while Kindle uses a proprietary format that can only be read using the Kindle. Amazon has also been under fire for its Kindle content deals with newspaper publishers who object to giving up 70% of the subscription generated revenue. Sony promises to do better, but has not yet revealed its plans. Priced around $400, the Daily Edition is priced about $100 under the Kindle. The new device has a 7″ screen and uses AT&Ts 3G mobile broadband service for downloading. Other Sony offerings include the Pocket Edition ($199) and the Sony e-Reader ($299).